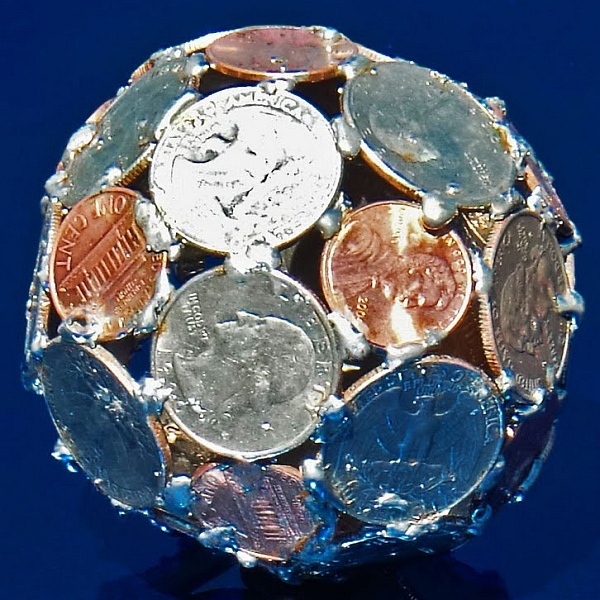 The diameters of US quarters and pennies are very close to the ratio needed to make a truncated icosahedron, i.e., a soccer ball in the US or a football elsewhere. Copper pennies take the place of the usually black pentagons and quarters take the place of the usually white hexagons, so even the colors work out. This ball was soldered together by Cory Poole. Puzzle: Can you work out what it cost before looking at the answer found here? This article first appeared on Make: Online, August 8, 2011.